A Microsoft Dynamics 365 Remote Assist user on HoloLens can work collaboratively with a colleague (typically an expert in a particular field) during a video call by using Microsoft Teams. The expert can see everything that the Remote Assist user sees, and they can holographically draw and annotate together. For example, let’s say a first-line worker is servicing a very complex machine and isn’t sure how to solve a problem. The first-line worker can call an expert anywhere in the world and have the expert assist with the servicing using annotations or files. Setting up this collaboration using Teams is simple and it’s free for the expert. A subscription to Remote Assist. 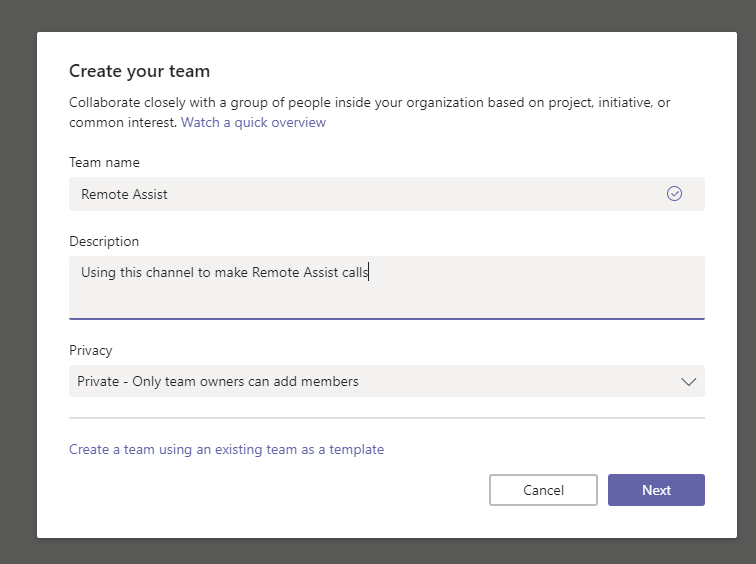 The Remote Assist subscription includes a subscription to Microsoft Teams. A HoloLens running the Windows 10 April 2018 Update (or later). An Azure Active Directory account. A PC running Windows 10 with the latest version of Microsoft Teams or a mobile device running Microsoft Teams Mobile. The expert uses Teams to communicate with the Remote Assist user on HoloLens. Teams may be available as a free download. A free Microsoft account. The expert might already have a Microsoft account if they signed up for the Microsoft App Store, Skype, Xbox, Hotmail, or Outlook.com. If the expert doesn’t already have a Microsoft account, they can sign up for one by going to https://account.microsoft.com/account. If you’re the admin for the main Azure tenant, go to https://admin.microsoft.com/adminportal/ to open the Office Admin portal, and then sign in. 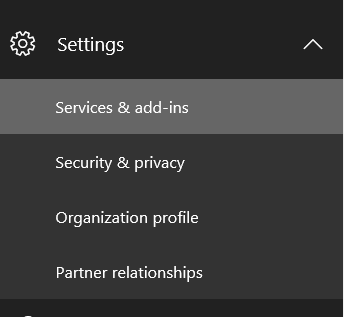 From the menu on the left, select Show More > Settings > Services & add-ins. 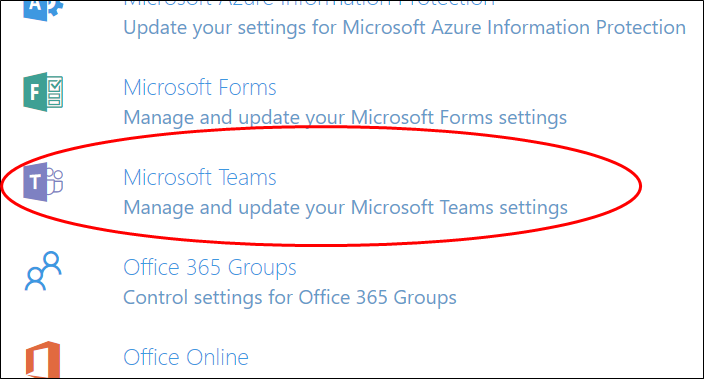 Select Microsoft Teams from the list of applications. Select Settings by user/license type. In the drop-down list next to Select the user/license type you want to configure, select Guest. 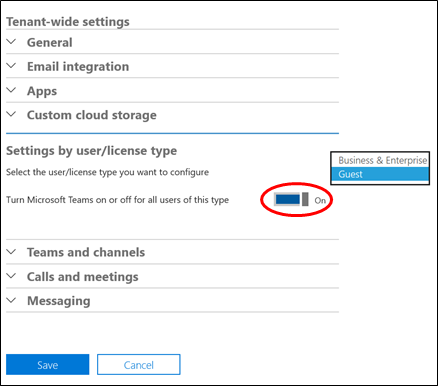 Set Turn Microsoft Teams on or off for all users of this type to On, and then choose Save. Wait an hour for the settings to propagate. In Teams, select Join or create a team to create a team if it doesn’t already exist. The Remote Assist user and the expert must be on the same team to communicate. When asked to add members, enter the expert’s Microsoft account. 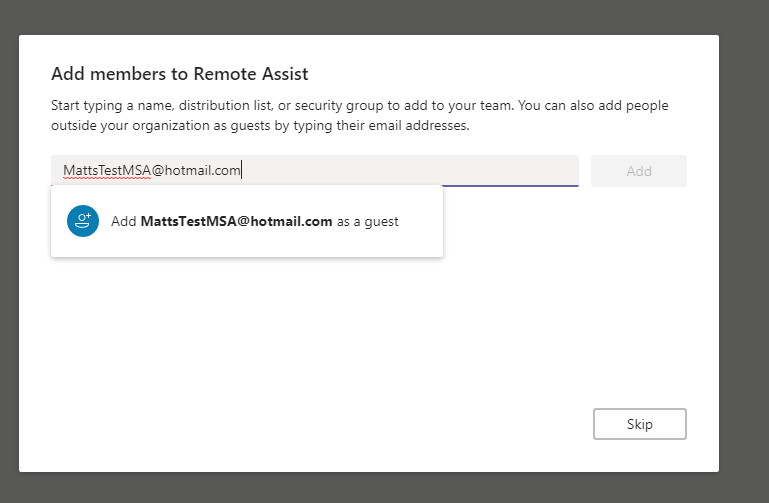 If you don’t see the option to add a guest by typing an email address, it’s likely that guest access isn’t enabled on your company’s Azure tenant for Teams. Enable guest access as described earlier in this topic. The expert will immediately receive an email message and can click the link in the message to open (or download) Microsoft Teams. This version of Teams is free and is not a trial version. The expert launches the Teams app and the Remote Assist user on the HoloLens signs in to their account as usual. If this is the first time the expert has launched Teams and the expert has not been invited to any other teams, Teams will automatically take the expert to the correct place. If the expert has been invited to other teams, the expert might need to switch to the appropriate tenant. Teams might take a few seconds to reload. Either party can make the call. You might need to search contacts to find the right person. The guest can call any member on the same team. To extend this functionality, invite any other members within your company who would benefit from being able to access this new expert. Once Teams is installed, the expert can make video calls to (and receive them from) contacts using Remote Assist on a HoloLens. When in a call, the expert will see the contact’s space—including the holograms—and can use the Mixed Reality toolbar in the video call window to add holograms. Select anywhere in the call window. Select one of the items on the Mixed Reality toolbar. In edit mode, the expert will still see a live stream of the call in the corner of the app window. To add arrows, select Place arrow . To add ink, select Ink . To change the arrow or ink color, select Pick a color . To add a file, select Insert files , and then add an image file or a PDF file. After adding them, images can’t be moved, deleted, or resized by the expert. Select the live video feed in the corner of your screen. While in edit mode, select Undo to undo the last action. While in edit mode, select Erase all to erase all of the annotations made during that editing session. While in live mode, select Erase all to erase all of the annotations made during that call. Specific drawings or arrows can’t be removed. Only the HoloLens user can make changes to or delete pictures added by an expert. When you share your desktop or running application with a Remote Assist user, the user's video feed will change to a solid color. They'll still be able to use all the tools in the toolbar even though their video feed will no longer be displayed. In Teams, select the Open share tray button. Select the screen you want to share. You can only share one application or screen at a time. If you want to share a different screen, select the Close share tray button to stop sharing, select a different screen, and then start sharing again.